This is that time of the year when Lord Ganesh comes to the city. Ganesh Chaturthi marks a carnival of sorts in the city. It is hoped the coming of Ganesh would usher in good fortune and prosperity. For me, despite being very non-religious, Ganesh always signified the coming of something serene and calm, a hope, something to look forward to in a new beginning. That, for me, is my strong bonding with the Almighty, a strong inexplicable feeling, an intense personal feeling. I am not alone in that feeling. Good fortune, good beginnings, that is what the city also hopes for in this season of Ganesh Chaturthi. It is said that the festival used to be celebrated in the confines of homes till the advent of the freedom movement. When the British imposed restrictions on public assembly in the late 1800s, Bal Gangadhar Tilak organised public celebrations of the festival on a grand scale. It was a way to get around official restrictions and to foster nationalism. Obviously, religion had been and will continue to be the opium of the masses. Bal Gangadhar Tilak used religion as a tool for greater good. But religion can be misused too. In over a hundred years since the public festivities started, the city has grown into a megapolis with over 19 million people. Now the lofty causes of nationalism have given way to rousing the rabble. Anyone visiting Bombay now would find Ganesh pandals all over. The pandals invariably are emblazoned with images of Ganesh flanked by photos of politicians, of all shapes and sizes, of all colours and creeds, of all ideologies, some ignorant, some xenophobic, some outrageously corrupt, shamelessly smiling at the insignificant passers-by. Now that should not be termed as a smile, a smirk would be more appropriate, for the politicians seem to have fooled the people by sponsoring pandals, while ignoring the real issues the city faces! Frankly, politicisation of some of the pandals even puts election rallies to shame. One's relationship with Almighty need not be displayed. It would always be there. But politicians ignore all that. But here, we believe in taking out long winded, slow moving processions to the beaches for the customary immersion, accompanied by sing-song, impromptu dancing on the roads and bursting of crackers, perilously close to the moving traffic. These juggernauts invariably lead to maddening traffic jams stretching out for kilometers. It is certainly not funny, when I say it could take an hour drive a kilometer. Think of an ambulance carrying a critical patient to the hospital. Would the Almighty ever bless His frenzied devotees for the inconvenience caused to the hapless patient? Perhaps not. But religion still remains, and will remain the opium of the masses. And our politicians will continue to rouse the rabble, to meet their own ends. 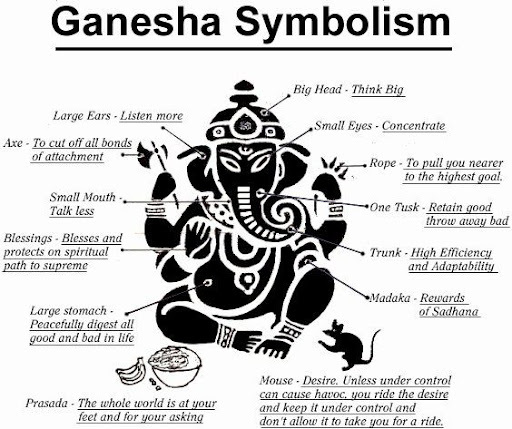 In the process, the virtues that Lord Ganesh symbolises, have and will continue to get diluted many, many times over!